I love planning meals for the week. It doesn’t always run smoothly being the busy mom that I am, but I like having an idea of what the weeks meals are going to be. My father always told me “if you fail to prepare… prepare to fail!”. I’ve applied that to so many things in life, both big and small. Last weeks meals were great as usual. Here are the new things I’ve made that fit well into my healthy lifestyle. When I was younger, being the oldest child and the GIRL, I sometimes had to make a quick meal for my 2 brothers when my parents were running late from work. 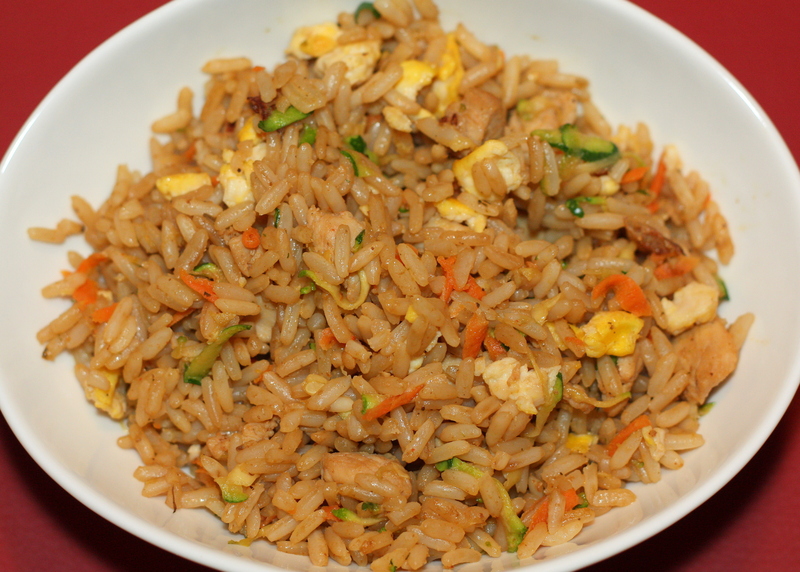 I used to make fried rice using leftover rice, hot dogs and scrambled eggs (It was good too!). Boy have I come a long way! I have witnesses! I decided to make a new version of fried rice. 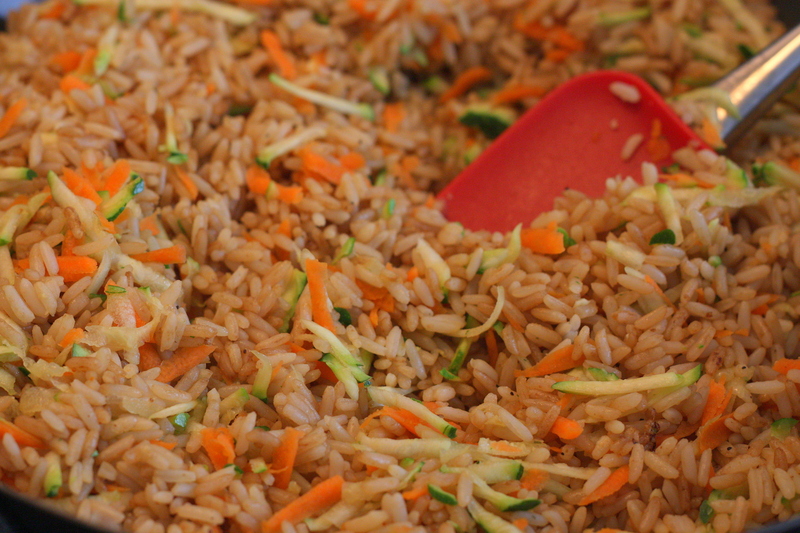 I gratered zucchini and carrots into the fried rice before adding scrambled eggs and chicken. Not too shabby! 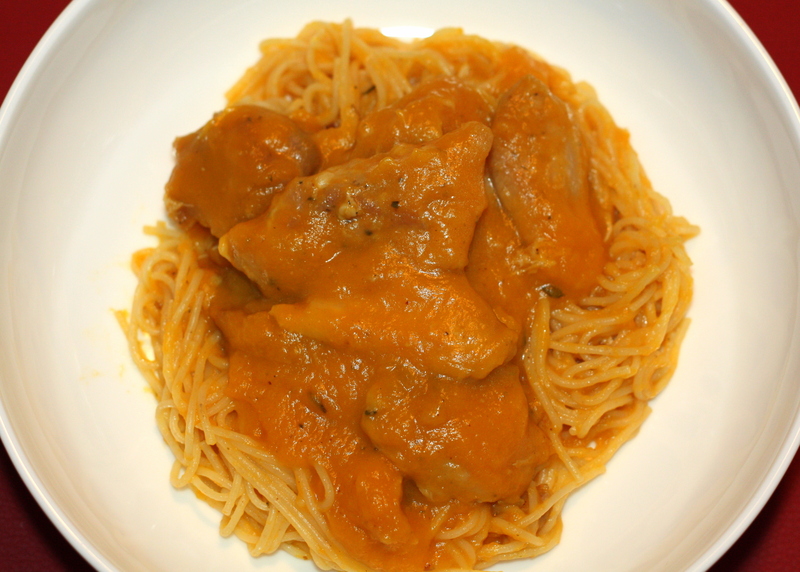 I absolutely loved this – Braised Chicken in Butternut Squash Sauce. The original recipe called for Red Bell Peppers for the sauce, which I tried a few weeks ago but I wasn’t doing cartwheels over it. But I liked the consistency and the process. So I tried it again but with Butternut Squash instead. The texture was wonderful and I enjoyed it with spaghetti. I came across a lot of recipes for this past St. Patrick’s Day, and although I wasn’t up for baking with beer for the occasion – I was curious to know what Soda Bread was. So I decided to give it a try. You know… to pay homage to my Irish lineage 🙂 I will in the near future, try baking with Guinness just to say I did. My curiosity often gets the better of me. 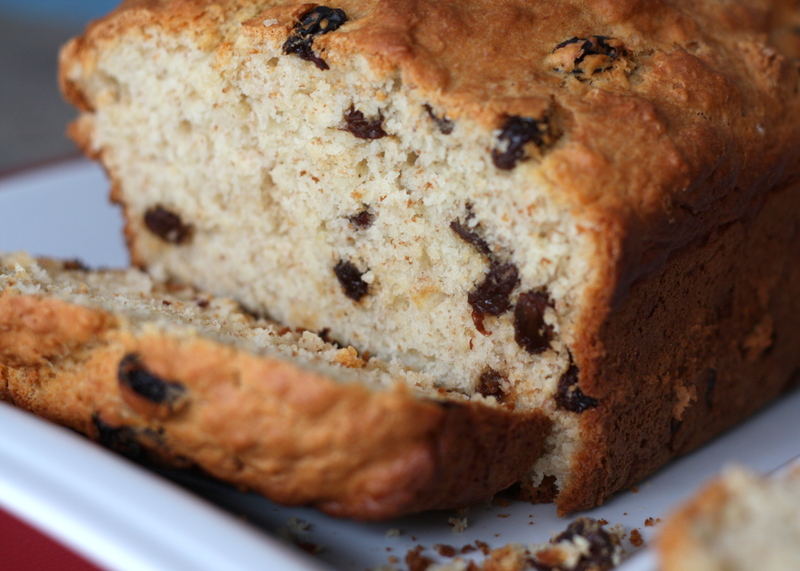 The Soda Bread was great – tasted just like raisin bread made with love. That’s all for this week. I’m still watching my weight while watching my figure. Stay focused and happy eating! You must start posting recipes. Healthy eating sure has come a far way. Those look so delicious. My zuchinni turned out good on Sunday. I didn’t ebjoy it much though, a little too bland for my liking but I will certainl experiment with it in another way. Yummy! Can’t wait to see you and taste your hand again! I remember that delish fried rice from high school days! Sell off!! I think zucchini is an acquired taste and may need additional seasonings to spike your taste buds. Hey, the fried rice from the 90’s tasted great because it had the lovely salty taste of delicious processed meats! I forgot bacon used to go in there too! We used to love Grace hot dogs gone to bed. This blog is about my exciting adventure in weight loss. I’m challenging myself to get into the best shape my body has been in over a decade. I’m also celebrating the fact that my child baring days are over! (I hope, anyway :-)). I’m taking a pretty light-hearted approach to this journey because its more about celebrating my accomplishments, feeling good about my physical being, and appreciating my inner being as a wife, a mother, a sister, a daughter, a cousin and a friend ♥. This journey has other benefits aside from mere weight loss. I intend to use this opportunity to embrace a lifestyle change that will allow me to teach my children how to eat healthy and sensibly. I also hope to incorporate some sort of exercise that will become a normal aspect of life like going for walks and hikes. I’m starting this adventure on my own but I hope to find company along the way!